More combatants await the release of CMON’s upcoming A Song of Ice & Fire: Tabletop Miniatures Game. The Night’s Watch starter set will release on October 26 along with five other expansions, following three Heroes expansions releasing on September 28. 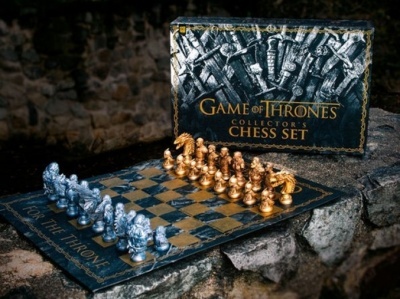 A third faction will emerge onto the tabletop battlefield with the release of the Night’s Watch starter set. 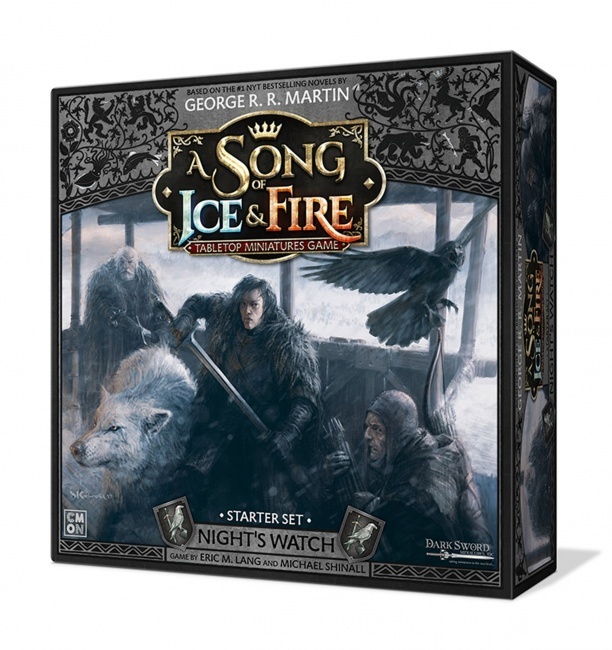 This boxed set includes a complete Night’s Watch force, with two units of Sworn Brothers, one unit of Veterans of the Watch, a unit of Ranger Trackers, and heroic leaders to command them including Jon Snow, the Direwolf Ghost, and Jeor Mormont. In addition, the set has dice, tokens, terrain, and the other components needed to play the game. The Night’s Watch starter set comes with 47 pre-assembled unpainted miniatures, a rulebook, 83 cards, a measuring stick, 71 tokens, 1 tactics board, 11 dice, 5 movement trays, 10 terrain pieces, and 3 castle walls. MSRP is $79.99. 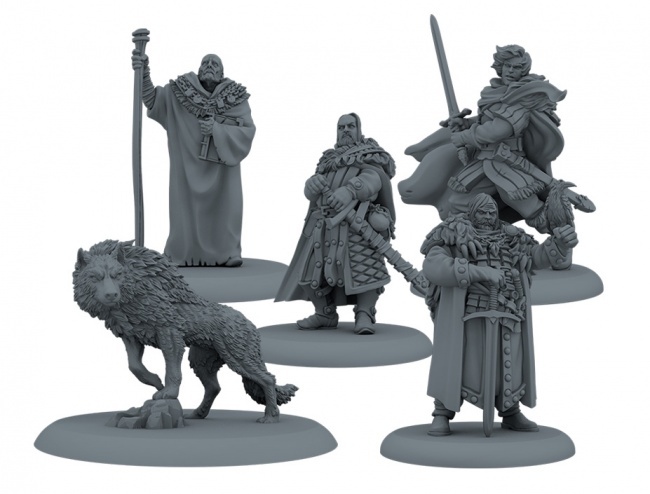 Stark Heroes I presents a half dozen iconic characters from that house, including Brynden Tully, Eddard Stark, Bran Stark, his companion Hodor, and the direwolf Summer. In addition to the 6 miniatures, this set has 2 unit cards, 5 attachment cards, 24 tactics cards, 3 NCU cards, and 1 movement tray. MSRP is $34.99. Lannister Heroes I features five characters: the Hound, Tyrion, Lord Tywin, Maester Pycelle, and the High Sparrow. This set has 5 miniatures, 4 attachment cards, 18 tactics cards, and 3 NCU cards, for MSRP $34.99. Unaligned personalities can be found in Neutral Heroes I, which has Roose Bolton, Ramsay Snow, Petyr Baelish, and Lord Varys, a total of 5 miniatures, 4 attachment cards, 26 tactics cards, and 3 NCU cards. MSRP is $34.99. Sworn Brothers adds another unit of core troops for the arm, equipped with strong armor and two-handed greatswords. This set includes 13 unpainted miniatures (12 Sworn Brothers and 1 Watch Captain), a unit card, an attachment card, and a movement tray. MSRP is $34.99. A ranged element can be added to the army with the Ranger Hunters expansion, featuring a dozen archers, a unit card, and a movement tray. MSRP is $34.99. Meanwhile, the Builder Scorpion Crew adds a siege engine to the force, which includes a large projectile launcher and its three-man crew on a large movement tray, as well as two unit cards. MSRP is $34.99. For House Stark, the Umber Greataxes offer a versatile and flexible unit. This set has a dozen axemen, a unit card, and a movement tray for MSRP $34.99. House Lannister, meanwhile, can turn to the arcane Pyromancers to add some firepower to their forces thanks to their volatile green “substance.” This unit comes with a dozen figures, a unit card, and a movement tray. MSRP is $34.99. 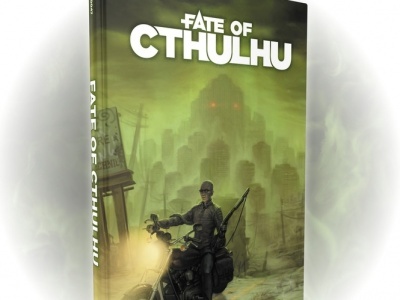 Click on the gallery below to see images of the miniatures and packaging for the expansions. 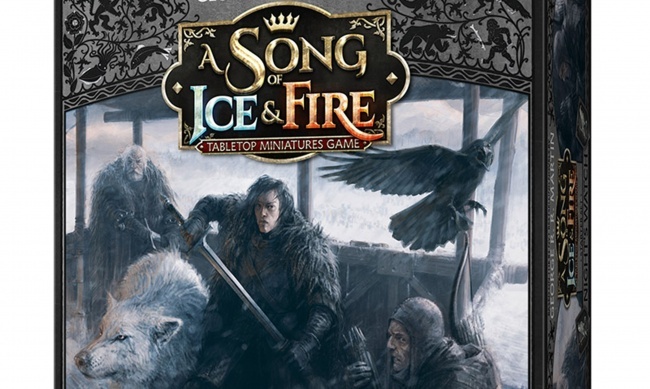 Scheduled to release in August, A Song of Ice & Fire: Tabletop Miniatures Game (see “Stark and Lannister Clash for Control of the Seven Kingdoms”) will be supported by five expansions upon release (see “Big Q3 for CMON’s ‘A Song of Ice and Fire’”).